hi there - we've got a new sprinter smb but i utterly failed to ask for a water filtration system prior to build. we have solar, 4x4 & larger fresh water tank so we can boondock as long as possible -- but we want to be able to (safely) fill up at streams and lakes. i know not to dunk into blue-green algae-filled areas, but crypto and giardia aren't so easy. we have the 144" rb w/ penthouse, so space is a premium. smb west said it would be "a major project" to integrate an in-line system at this point. anyone have good ideas (general or, even better, very specific!) of system to buy or build to minimize odds of putting nasty water in our tank -- or us? i didn't see a thread about water so i'm hoping this thread can also serve as "all things water safety" related. thanks much for your input! Holy Crappers, you can do that?!?!? I NEVEr thought about doing that! How cool and ingenious! Great question/new thread....OK, another project, more money, and closer to being off the grid...sounds fantastic!!! The SMB Forum strikes again! Ps BBasso, any pics or a thread you started going over that.. etc? Check out my photo album . But just this one of the filter in action this past summer in the Ashville area. I hang it from my roof rack with some rope to put it in reach. When it goes through the on board water system on board it gets filtered one more time. Nice. We have a 4 liter Sawyer on board but haven't had to use it yet. Very similar type of filter. 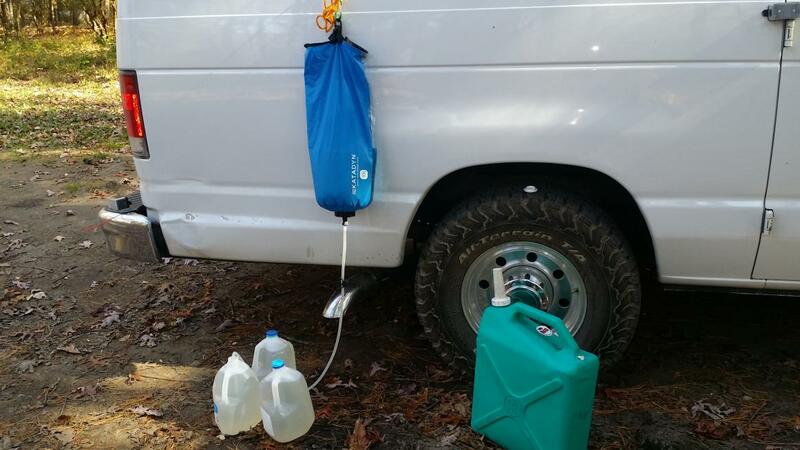 We have a 2 liter platypus gravity feed that we can use for extra water in an emergency. And its light enough to take backpacking. Depends if you want a filter or a purifier. The katadyn 10 liter filter has a o.2um (nominal? or absolute?) filter. That is good biological filter for everything but virus (which are rare). IF you added a little chlorine (2ppm) to the filtered water the chlorine would kill all viruses and you would have a water purification system. If you were concerned about possible farm land run off (insecticides or such) then you would also need some level of charcoal filtration. Katadyn makes very good products. Berkey filtration systems are also excellent. thanks to all who replied -- your experience and insights are greatly appreciated! we've not yet settled on a system but will take some pics and post when we do. other comments of course welcome. this forum is the best!